Smart home lighting is a growing field, with entrants including Philips and LIFX, but one other new contender has a different approach that might appeal more to some. The Brightup system consists of plug socket hardware and in-wall dimmers, connected to and controlled by a central hub via Z-Wave RF tech, to provide remote dimming and intelligent behavior/programming to any and all lighting systems in your house. The Brightup offers remote control of your lights, but that’s just the beginning. It also has geofencing so that lights can be set to turn on or off when you enter or leave the house; there’s an ambient light detector that can tell when you turn on the TV to automatically dim your lights for improved viewing conditions; the same ambient light sensor detects fading natural light and can tell when the sun comes up in the morning to control light levels. Random scheduling will simulate being home even when you’re away, and you can use lights to let you know a timer has gone off, which is handy for cooking, for instance. The system’s components are nicely designed, and the project creators say you shouldn’t need outside help for installation. Brightup also measures and records energy usage, and provides remote access that you can share with family members and friends. The in-wall modules look a little more complex in terms of installation, but they should work in your existing receptacles behind the light switches you already have according to Brightup, which means no new holes required. 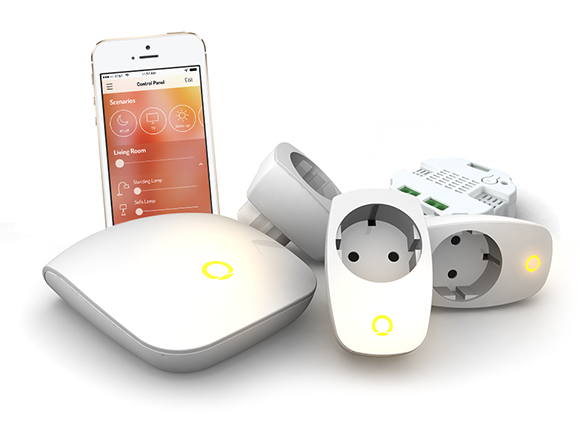 The Hamburg-based company is looking to raise €130,000 ($178,000 U.S.) on Indiegogo over the next 46 days to build Brightup, with starter packs including a central unit and three in-wall or socket connectors for €199 ($272 U.S.). The cost is considerable; A Philips Hue starter set runs $199 and includes three bulbs plus the central control hub, but Brightup works with lighting other than what comes in the package, and Hue is really an entirely different kind of product. As the connected home and home automation space gets more crowded, it’s interesting to see the different approaches companies are taking to solve essentially the same problems. Brightup’s system has plenty of merit, but it’s competing with some heavy hitters already in the mainstream market including Belkin’s WeMo line. With Z-Wave and an open API, it does seem one of the more extensible and future-proof options out there, however, so that may play a role in getting customers on board.